This zingy salad is perfect for a summer party or any other time you have a cold beer in your hand. 1. Peel the potatoes and cut them in to ½-inch cubes. Do the same for the carrots. Boil them together until cooked, about 10 min, then rinse under cold running water to cool them down. Set aside. 2. Boil the eggs for 8 minutes, until hard-cooked, then peel and cut into ½-inch dice. 3. 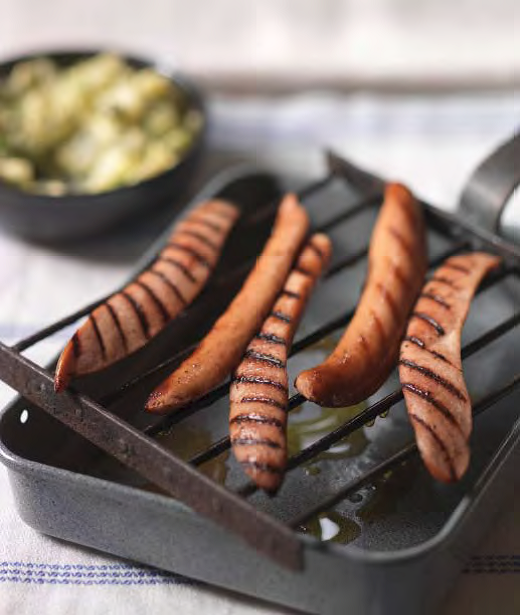 Cut the Frankfurters lengthwise, coat with the vegetable oil, and grill or fry until nicely crisped up. 4. Place the potatoes, eggs, carrots, gherkins, capers, parsley, spring onions, dill, mayonnaise, mustard, crème fraiche (or sour cream), salt, black pepper and lemon juice in a large bowl and mix them together gently. Serve with the warm Frankfurters.